"I have learnt that there is great power in words, no matter how long or short they be." Proving the power of words is an utterly magical book which Harriet loved and told me I must read, and now that I've done so I'm very glad I took her recommendation. 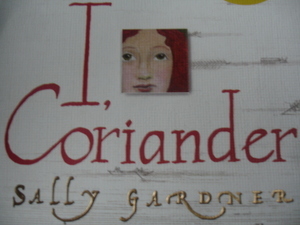 Sally Gardner's novel for older children I, Coriander , is the story of young Coriander Hobie who grows up in a loving and prosperous family beside the Thames in seventeenth century London. Her mother is a herbalist and maker of remedies whose gifts, it seems, go beyond the purely scientific. But forces from outwith Coriander's settled world destroy her happiness until she is able to discover her own power and win it back. Then, torn between love and duty, she faces an impossible choice. 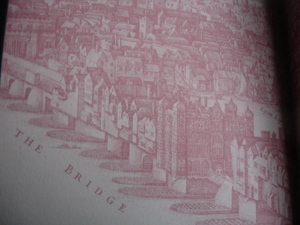 The book is set in the time of the Commonwealth and the Restoration and displays a real feel for the period in its social historical detail and its treatment of the wider issues which prevailed, but at heart it's a fairy story about good and evil, beautifully and richly written and quite delightful. Sally Gardner could have come a cropper with her combination of fact and spell-binding fantasy, but there isn't a false step in the book, to my mind. She depicts puritanical zeal, an extreme religious sect, witch-hunts, a Frost Fair on the Thames, London life and much more besides, but all so beautifully and grippingly that it has to be one of my reading highlights of the year.